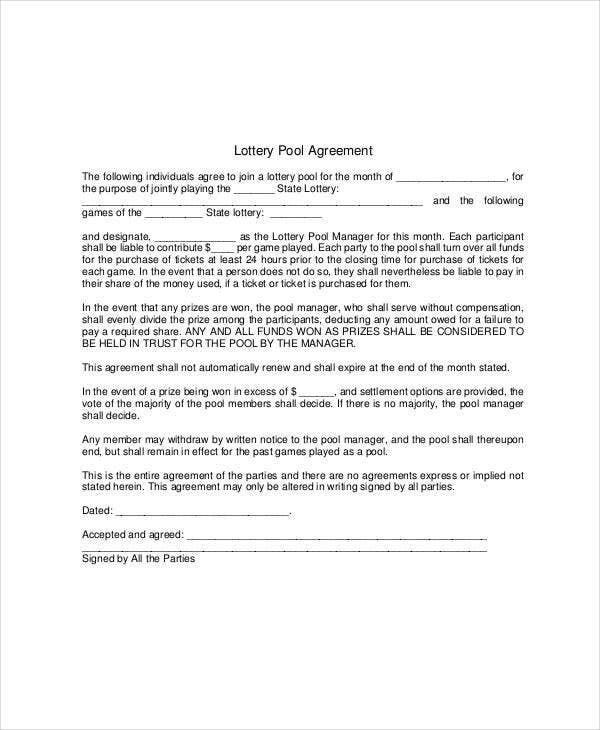 On the search for lottery pool agreement samples? You’re on the perfect page. 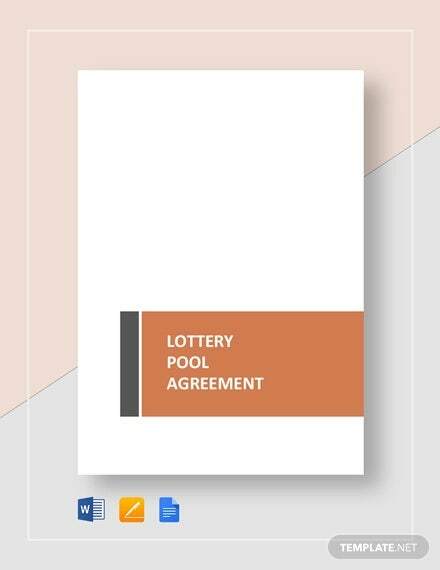 A lottery pool agreement is considered as a binding contract which sets out the rules and procedure in order to conduct a peaceful, orderly, and impartial lottery pool. If drafted correctly, it can help prevent fraudulent schemes and events. 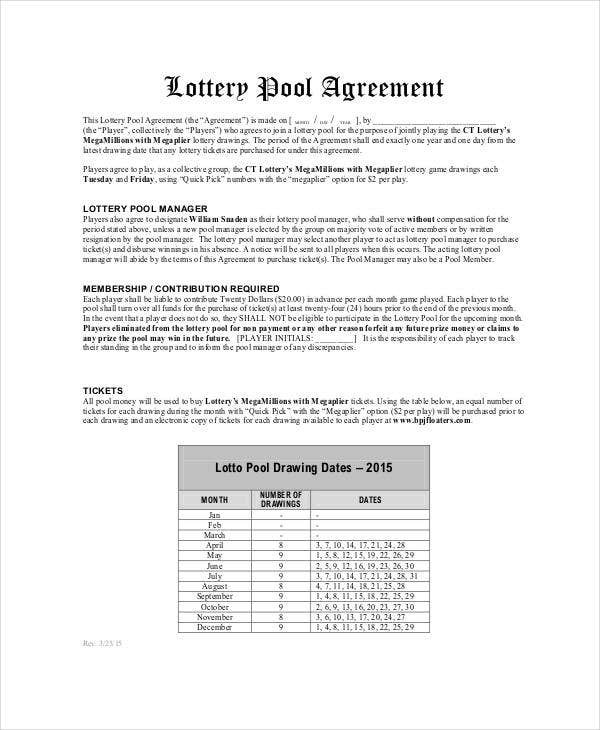 In connection to this, we have here an array of lottery pool agreements templates that will guard your games. They are of great quality and definition. Feel free to access and download them. Aside from this, Template.net also offers other Agreement Templates, which are also of great quality and design. It is a form of legalized gambling which involves the drawing of numbers for a certain prize. The procedures and rules governing lotteries vary from country to country. Lottery, as a form of authorized gambling, is also regulated in a certain extent. For instance, most countries prohibit the sale of lottery tickets to minors. It also comes in various mechanics and dynamics. The prize can be a fixed amount of money or a series of goods and other items. Commonly, the prize fund depends on the fixed percentage of the receipts. In terms of the probability of winning the lottery, the chances of winning a lottery jackpot can vary on the structure and dynamics of the said lottery. It is also influenced but various factors. 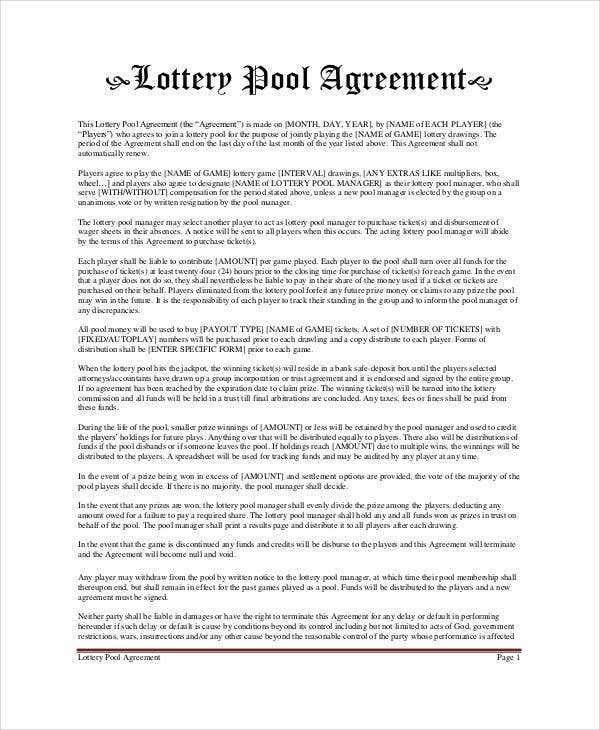 These are just some of the basic characteristics of a lottery. You can also learn more about them along the way. 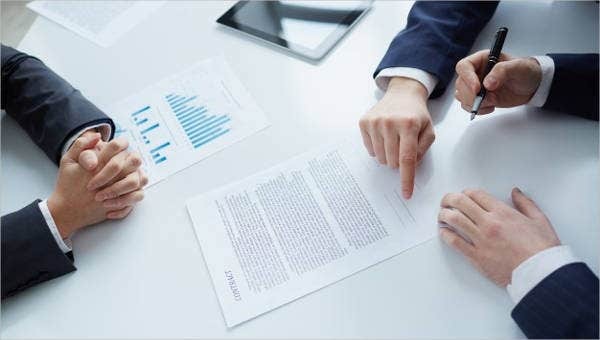 Aside from them, we also have other agreement templates such as Confidentiality Agreement Templates and Loan Agreement Templates. Feel free to download them. A family, association, or any group of people contributes money to buy more lottery tickets. They will come up with the agreement that if ever they will win, they have to split the rewards and prizes among themselves. 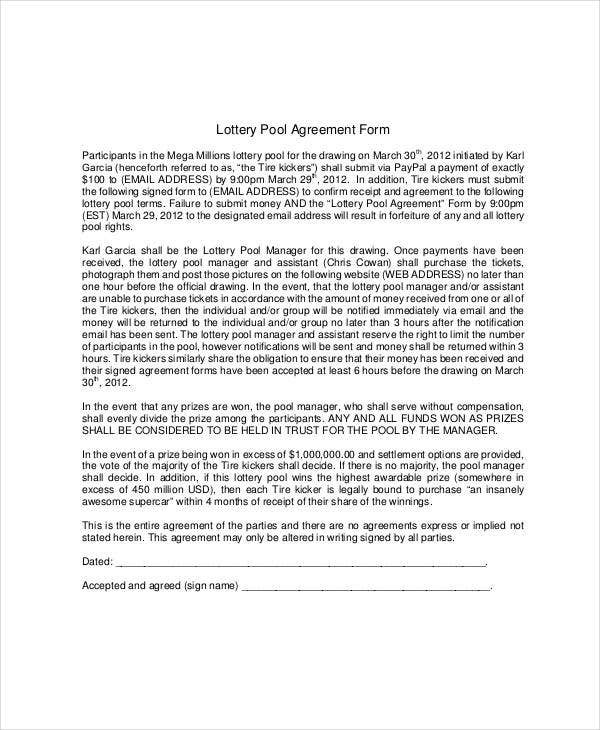 In this arrangement, the participants are pooling their resources in order to get better odds of winning the lottery. 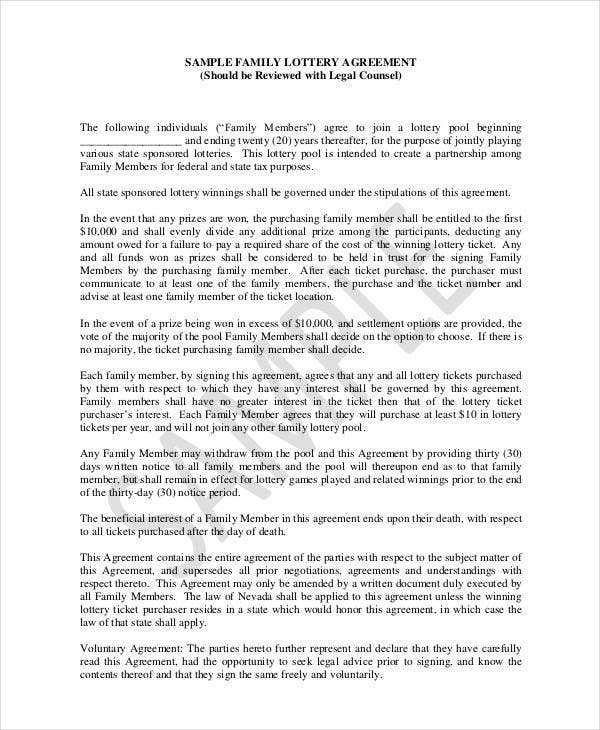 You also have to take into account that any group of individuals can arrange a pool agreement provided that all of them consented and voluntarily entered in the agreement. 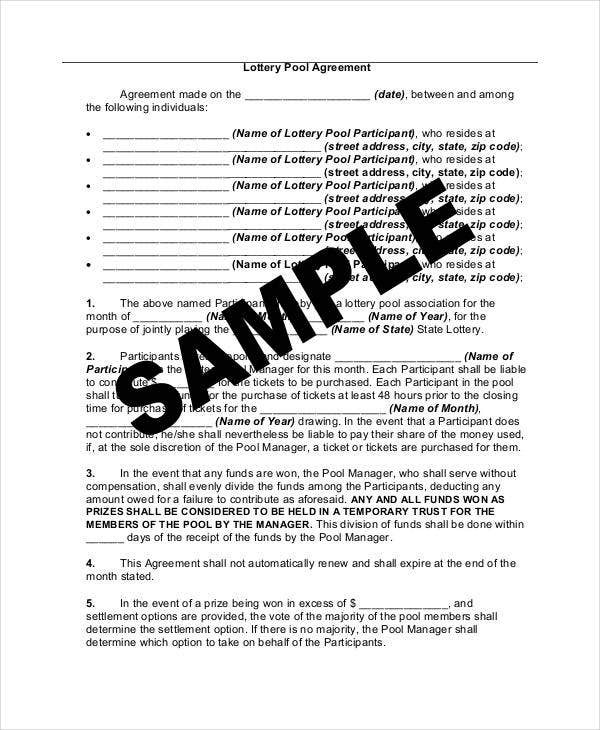 The legality of drafting a lottery pool agreement depends on the laws and regulations of your country. It may be legal for some while others may put stringent restrictions. 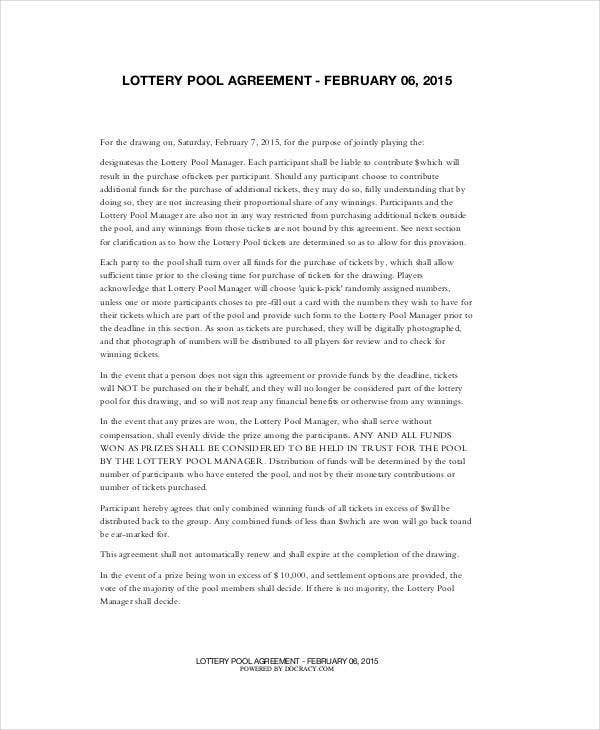 In line with this, lottery pool agreement are very critical contractual instruments. The parties must laid down clear and specific provisions in order to divide the winnings in a smooth and dispute free manner. Aside from them, we also have License Agreement Templates, which are also of great quality and definition.